When should you choose tube over hydraulic hose? 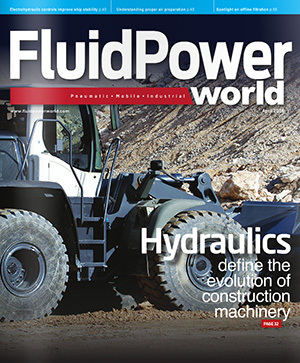 Josh Cosford, Contributing Editor to Fluid Power World, weighs in on when you should choose pneumatic tubing over hydraulic hose for an application. Tube I think is for good permanent applications. Sometimes it has a higher pressure capacity. It also has a cleaner look. They last longer and they don’t fail as rapidly. It all depends on application. I would always go for tube first. Consider if the application requires either some sort of vibration resistance. For example, I’ve had hydraulic power units that were plumbed up with coolers and a whole bunch of components that were on top of this power unit and there’s this vibration noise that we couldn’t seem to track down. It was all plumbed up with tube. We tried to isolate where the resonant frequency was coming from, where the vibration was coming from. We ended up adding some hoses there. The hoses have some flexibility and some give so they will absorb some of those vibrations and can kill some of those annoying noises. The other thing too is if you need that flexibility. If you have any kind of machinery where there’s two different actuators or components reports that are moving on different planes, you absolutely need to have a hose. I would generally always pick tube first because it’s more permanent and reliable. If tubes don’t work, then go for the hose.